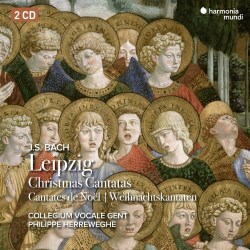 These Bach Cantata recordings are not new, they were originally made by the Collegium Vocale Gent, under the inspirational direction of Philippe Herreweghe, in 2001-2002, and released a year later together with the Magnificat. At the time, they garnered very positive reviews. As I missed them first time around, I was eager to catch up on this straight reissue. So what have we got? Bach supplied numerous works for Christmas feast days during his lengthy Leipzig tenure (1723-1750). The four cantatas presented here date from his first two Christmases there: "Christen, ätzet diesen Tag", "Gelobet seist du, Jesu Christ", "Christum wir sollen loben schon" and "Ich freue mich in dir". The Magnificat, in the less familiar E flat version, which includes four seasonal interpolations, also featured in that first Christmas of 1723, and is included here. The celebratory nature of this music makes this an uplifting experience. The opening Choral of BWV 63, for instance, has a life-enhancing quality, which cannot fail to exhilarate the listener. That of BWV 91 is triumphant, and the lovely profiling of the horns and trumpets sets the uplifting tone that permeates the work. In fact, the opening Chorals of all four set the general tenor of joy and abandon that suffuses these magnificent scores. There are some ear-catching arias. O du von Gott erhöhte Kreatur from BWV 121 is eloquently rendered by Mark Padmore, whilst Wie lieblich klingt es in den Ohren from BWV 133 gets a beguiling expressive rendition from Dorothee Blotzky-Mields. I particularly enjoyed the Magnificat, heard here, not in the usual key of D major, but in E flat. It's my first encounter with this version, which incorporates four Christmas interpolations, hymn-based and in keeping with the Leipzig seasonal customs. They sit well in the overall scheme. The a capella Vom Himmel hoch, the first of these, gives us the opportunity to hear the choir in spotlight. Their immaculate ensemble, clarity of diction and radiant warmth are exemplary. The other interpolation that caught my ear is the soprano and bass duet Virga Jesse floruit, exquisitely phrased and blended by Carolyn Sampson and Sebastian Noack. Herreweghe has chosen an impressive line-up of soloists, Mark Padmore and Carolyn Sampson being two I was already familiar with. The others are likewise top-notch. Dorothee Blotzky-Mields I found particularly distinctive. These are thrilling performances in superb sound, Herreweghe coaxes the very best from the soloists, choir and orchestral players, and his attention to detail is second to none. A perfect balance has been struck between all participants thanks to the sterling efforts of the recording engineers. The inclusion of a full libretto in German, French and English is most welcome. I've nothing but praise for this recording, and it gets my full-hearted endorsement.